Nashville, TN -- Traditional country fans and bluegrass fans alike have a unique opportunity to honor the memory of some of country's biggest stars and to enjoy one of the most highly awarded bluegrass bands touring today. The Grascals are set to make an appearance at Gone But Not Forgotten, an event honoring Patsy Cline, Hawkshaw Hawkins, Cowboy Copas, and Randy Hughes. This year marks the 50th anniversary of the tragic plane crash that took the lives of the Opry icons. Nashville, TN --- Danny Roberts, mandolin player extraordinaire for bluegrass music's The Grascals, made his television debut this week. 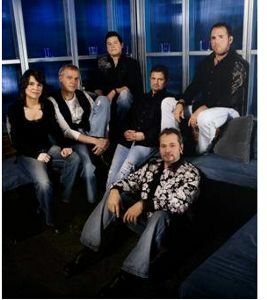 Roberts appears in the hit series ‘Nashville’ as a member of the “Rayna James” band. His first appearance is in an episode entitled “Hit The Road.” Roberts is unsure of just how many episodes he may appear in, but he’s taped several segments. In one scene, he plays the bouzouki on a duet by characters Rayna and Juliette. He also plays guitar and sings backup for some upcoming episodes. Although he’s not yet had a speaking role, Danny has filmed a few "non-musician" scenes as well. Nashville, TN -- Multi-award-winning band, The Grascals, will perform at the Smithsonian Institution’s National Museum of the American Indian on January 21st at 7:00 p.m. for a celebration of the Inauguration of the President of the United States. The Native Nations Inaugural Ball will feature music, dancing and native cuisine. Funds raised will support the educational programs of the National Museum of the American Indian. Nashville, TN --- The Grammy-nominated Grascals participated in the third annual Christmas 4 Kids Tour Bus Show and Artist Meet & Greet in Hendersonville, Tennessee. For a donation, fans have the opportunity to tour the homes-away-from-home of more than 50 artists and celebrities. The Grascals and many other artists are onhand to sign autographs and give fans and inside look at their tour buses, some of which are decorated from top to bottom for the holiday event. Arden, NC -- The Grammy® nominated Grascals have launched a new one-of-a-kind website to kick off the new year. The new web site is designed in a style that makes for a fun and easy way to see fresh content and is set up to allow an even greater connection between the band and their fans. Fans will appreciate that the website is also easily accessed through mobile and tablet devices. The Grascals and Steep Canyon Rangers join the ranks of bluegrass music artists who received nominations during Wednesday's announcements. It was while performing with other songwriters at a Nashville benefit for Operation Troop Aid that Jamie Johnson, a founding member of The Grascals, learned that the band has been nominated in the 55th annual Grammy Awards. Nashville, TN --- The Grascals were among the impressive lineup of stars onhand for a special tribute to three living legends. Charlie Daniels, Vince Gill and Randy Owen were honored at the 9th Annual Leadership Music Dale Franklin Awards at Nashville’s War Memorial Auditorium. The venue, in fact, was the site of the very first Charlie Daniels Volunteer Jam. Nashville, TN -- The Grascals' latest album, Life Finds A Way, topped the Sirius XM Bluegrass Junction Chart this week with the highest number of plays. Additionally, the single, "Pretty Melody," which appears on the bluegrass music album, also enjoyed top spin status for a single. Nashville, TN --- Asheville Forest Music, a division of Crossroads Entertainment & Marketing, has announced the signing of songwriters, Jamie Johnson and Susanne Mumpower-Johnson (aka: Iodine). Jamie is known for his work with bluegrass music's super group, The Grascals. Myrtle Beach, SC -- Ocean Lakes Family Campground, a division of The Jackson Companies, will host the 14th Annual Premier Bluegrass Weekend on Friday, Aug. 24, and Saturday, Aug. 25, 2012. The event is open to all guests staying at the campground (campsite reservations can be made by calling (877) 510-1413 and rental reservations by calling (800) 845-2229). Featured bluegrass music entertainers include Doyle Lawson & Quicksilver, The Grascals, Big Country Bluegrass, Darin & Brooke Aldridge, Rich In Tradition, and more.